This single-volume collector's edition contains the complete collection of Pope John Paul II's Holy Thursday letters to priests. "On this holy day, the liturgy takes us inside the Upper Room." Thus wrote Pope John Paul II in 1979 in his first Holy Thursday letter, a tradition he continued until his passing in 2005. The Upper Room is the essence of his annual letters: coming to a deeper understanding of the theology of the priesthood, instituted that first Holy Thursday almost two millennia ago. 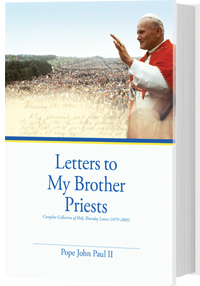 Letters to My Brother Priests will help every priest understand the theology behind his ministry. This book will help every seminarian understand the august status he pursues. This book will help every one understand why priests are so essential to every Christian’s faith and vocation within the Church.